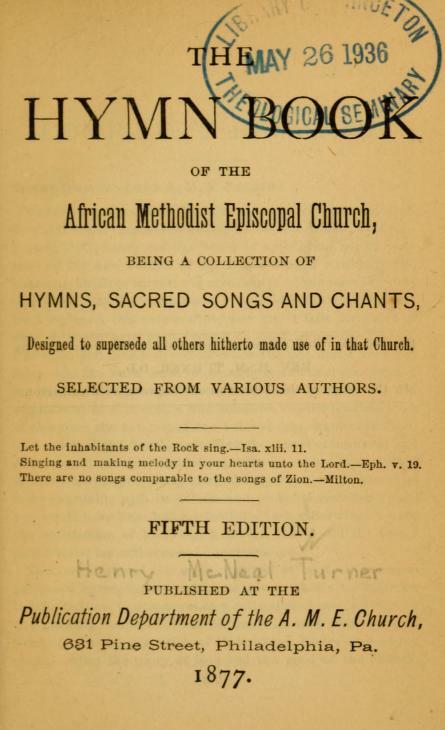 Below is the introduction of the collection of hymns, sacred songs, and chants compiled by Turner. In pursuance of a resolution adopted by the General Conference during its session in 1868, at Washington, D. C, doing me the honor of appointing me as compiler of the new edition of our hymn book, I now have the honor herewith to submit the manuscript of the same for your inspection. As you well know I have been about five years working upon this manuscript; and yet it falls far short of what I would have been pleased to have given the church. But when you take into consideration the fact that I have had to execute the work amid the most busy and onerous years of my life, traveling must of the time day and night, planting and organising new churches and missions, superintending most of the time the interest of our beloved connexion in the Empire State of the South, preaching thousands of sermons and delivering thousands of addresses, with no money appropriated to assist me in procuring clerical help—you will, I know, be more charitable with its defects and probable omissions, than you would have been had my facilities been otherwise. I have the satisfaction of knowing, however, that I did the best I could under my embarrassed circumstances. The magnitude of the work required at least, that two experienced hymnologists should be given wholly to it for an indefinite time, to prepare such a collection of sacred songs, as the growing demands of our church will very soon stand in need of. In the execution of it, however, I have had as my primal object the glory of God and the good of the church. Therefore I have disregarded the criticisms of our own day and the animadversions of posterity, and have collected and arranged as my best judgment dictated, such hymns as I thought would be best adapted to the present wants of our people ; leaving posterity to provide for themselves. In doing this you will observe I have drawn very largely upon the Wesleys, so much so, that it may be regarded as strictly a Wesleyan hymn book; notwithstanding, I had before me thirty-two of the best and most orthodox hymn books extant, from which I culled with prayer and great patience to make a collection of sacred poems, commensurate with the intellectual and literary status of our people. Several hymns were furnished by our own ministers, but, as they were so carelessly prepared in the main, the most of them were rejected. This statement is made with regret. Under the head of " Revivals" a large number of old " Zion songs" have been inserted. This may elicit the disapproval of some of our poetic neologists. But they must remember we have a widespread custom of singing on revival occasions, especially, what is commonly called spiritual songs, most of which are devoid of both sense and reason; and some are absolutely false and vulgar. 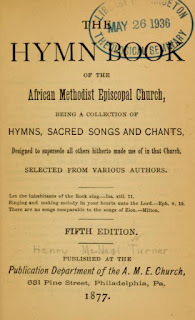 To remedy this evil, and to obviate the necessity of recurring to these wild melodies, even to accommodate the most illiterate, these time honored and precious old songs, which have been sung since the time " whereof the memory of man runneth not to the contrary," have been as it were resurrected and regiven to the church. Besides, I am not ashamed to say that I love those good old soul-inspiring songs a thousand fold more than I do these later day operatic songs, most of the music of which is composed by persons who know nothing of God or religion, and some of whom are avowed atheists. And my experience in this respect, I am rare, is the experience of thousands of the ministry and laity. I desire in this connection to tender my most grateful acknowledgments to Mr. William Steward, cashier of the Freedmen's Bank at Tallahassee, Fla., and to Miss A. G. Adams, an estimable young lady of Savannah, Ga., for valuable aid given in the consummation of this work. And now, venerable fathers, to you, to our ministry and laity, to the mourner in Zion, and to the heathen in distant lands, and to unborn posterity, I commit those previous pages with the trust, that when the writer shall be sleeping in the dust, they may be sung to the joy and comfort of millions; and upon this feeble effort to serve my church, my day and generation, I ask the sanction of heaven and the blessing of God the Father, Son and Holy Spirit. Amen. Savannah, Ga., June 2d, 1873.